Hemel Town skipper Jordan Parkes netted the opener against Hungerford Town on Saturday. (File picture: Marc Keinch). Hemel Hempstead Town won for the first time in three league outings when they defeated Hungerford Town 3-0 on the road on Saturday. 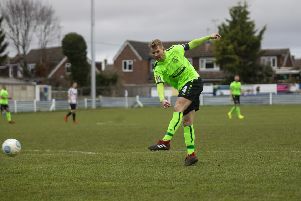 Tudors’ manager Joe Deeney was delighted as his team got back to winning ways in the National League South with what he described as an “excellent team performance” down at struggling Hungerford. Hemel set off at a decent pace and skipper Jordan Parkes missed an early effort when he miscued, but it was only a temporary reprieve for the home side as he put the Tudors in front on 16 minutes, tucking the ball home from close range for his eighth goal of the season in all competitions. Striker Rob Sinclair was only inches away from adding a second for Hemel before Hungerford had their first decent effort when Danilo Orsi-Dadomo side-footed wide when he was well-placed. The visitors really took control after this and two goals in three minutes pretty much put the game to bed. Leading scorer Steve Cawley put the finishing touch to some fine build-up play just after the half-hour mark and Hershel Sanchez Watt added Hemel’s third on 36 minutes. As the weather conditions deteriorated, the Tudors continued to create chances. Sinclair was put clear and was about to pull the trigger when a last-ditch tackle denied him just before the break and Sanchez Watt had an effort well-saved before the referee blew for half-time. Both Sinclair and Sanchez Watt had further chances in the second-half but Hemel had to survive a late Hungerford rally when Cameron Hargreaves hit the post and Hemel keeper Laurie Walker had to tip another effort wide from James Rusby who then saw his header cleared off the line with the clock ticking down. Deeney was full of praise for his side in a post-match interview with the Tudors’ Colin Perreira, saying it was “a really good, professional performance, after showing some excellent football in the first-half, they really dug in as the weather turned, with the wind picking up and the rain lashing down”. The players and management team had discussed last week’s below-par showing against Hampton & Richmond [a 1-1 draw at home] and they were determined to put it right, which he felt they did. Next up for the Tudors this Saturday is the juicy FA Trophy last-16 tie against high-flying Solihull Moors from the National League. Solihull are having an excellent season and it will be a tough ask for the Tudors but Deeney pointed out that they go into every game expecting to win -- and this tie will be no different. The players are looking forward to the challenge, he added. The club had two new signings hit the field as substitutes on Saturday, debutant Arel Amu, a powerful 23-year-old forward, and Leon Lobjoit. Amu, who has been signed from Dunstable Town and formally played for Luton Town, was a prolific goal scorer at Dunstable and is an exciting prospect. Lobjoit played for Hemel briefly in 2014/15 under ex-boss Dean Brennan, and Lobjoit’s former clubs include Northampton Town, Coventry City, Brackley and Oxford City. Saturday’s victory moved Hemel up into 14th place in the National League South table and they are now just seven points from St Albans City in seventh - the last playoff place - but the Tudors have two games in hand over their derby rivals. It was also the Tudors’ first clean sheet in nine matches. Hemel’s line-up v Hungerford: Laurie Walker, Joe Howe, Kyle Connolly (Ismail Yakubu, 43 mins), Jordan Parkes (captain), Darren Ward, Frankie Musonda, Hershel Sanchez Watt (Leon Lobjoit, 80 mins), Scott Shulton, Steve Cawley (Arel Amu, 77 mins), Rob Sinclair, Jack Snelus. Subs not used: James Kaloczi, Oliver Swain. Hemel man of the match: Jack Snelus.